So what are these Alt Tags? Well technically they aren’t tags, everyone just calls them that. The Alt part stands for Alternative Text. That explanation out of the way. Alt Tags are text that travels with images on your website. They have their origins in the early days of the Internet when some browsers couldn’t display images (unthinkable I know!). So instead the alternative text would display. You wouldn’t see the Surefire Design logo, you would see text that said “Surefire Design Logo”. Unless you turn on accessibility options for the visually impaired, you are probably wondering why these are important to you. Google. Yes good old Google looks at the Alt Tag content as part of the search engine optimisation of your website. They play into the description of the images for when they appear in Google Image searches, and you can load them up with your site search phrases. They really aren’t hard to do, and we have a Surefire Video Help video to show you step by step how to create Image Alt tags on your website images. For a start you might want to know what an SEO footer is! Simply put it’s a footer at the bottom of your site pages, that is largely there for Google and the search engines to find and read. It’s an opportunity to add in all those nice long search phrases, or search phrases that just don’t fit on your homepage. Some businesses simply do way too many things to clearly represent them in the core messages of their homepage. It might be a large number of specific products people are looking for. It can be a really wide range of services. Or it could be one person calls your service one thing, and another calls it something different. For instance Joe Public might call it something simple, and the Trade refer to your service or product by its technical name. The idea behind including these search phrases in the SEO footer, is to tell Google about them! So if you have an SEO footer on your website, don’t hold back. Think of the many different ways people might search and include as many as you can. The additional benefit to this footer, is that it can be really useful to your site visitors too. Often things are tucked away in the SEO footer that don’t fit on the main menu. Often have a wee look to see what is there. Something like ‘Meet the production team’ or ‘November Training Videos’ might catch my eye and draw me into the site. So with this second target of your actual visitors in mind, it makes good sense to link these search phrases up to relevant content within your website. If that content doesn’t exist, then here you have a roadmap for creating new content over time. Google likes links with good search phrases in them, and Google likes to see new content added to your website, consistently over time. Just half an hour every Friday morning should do it! 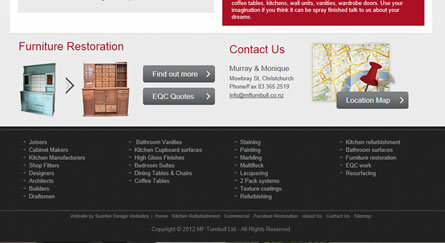 Here is an SEO footer example form one of our clients www.mfturnbull.co.nz. They are just starting to link them up. 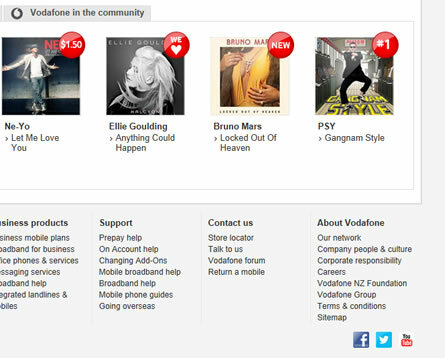 And here is an example from Vodafone. A links page can be really useful for your visitors, AND Google will love it. So its a win-win. Easy to create content that has a legitimate purpose! 1) First collate links to other websites that are on the same or related topic to your own site. These shouldn’t be general generic links like ‘www.google.com’. Rather they should be industry body sites, Government sites, supplier sites (if there is no conflict of interest), clubs, related industry sites. For instance if I’m on a builders site, I might want to see links to some recommended architects. How does Google look at links on your website? To understand this, first you have to understand the anatomy of a link. A link can simply be the URL that you want to go to e.g. http://www.surefiredesign.co.nz/blog/. The whole path is displayed and you click on it. This isn’t always the best way of presenting a link. Links are made up of a number of parts. * There is the destination page that the link actually takes you to. * There is the actual text or the image that you click on. It’s the second one we are interested in. You want this to have your search phrases in it. The reason being Google will look at this and so will your visitors. So it makes sense for this link to read naturally and describe where it takes you. They don’t have to be short! e.g. the text to click on may be “To learn more website tips and making your site more effective click here”. We know Google absolutely loves links TO your website. Partly because quality natural links are so hard to get. But did you know it also likes links OUT of your site, off to other related website and with really good search phrase descriptions to click on. This also applies to links WITHIN your website. Obviously it isn’t worth as much as those coveted natural links from others sites to yours, but interestingly it does have something to contribute to your rankings. So maybe think about a links page?